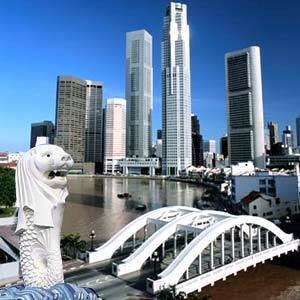 Singapore, literally meaning the lion city, is also called the garden city of the east. Though Singapore is a small island measuring only 617 km, yet it has one of the busiest ports in the world. It is well known for its oil refineries and is a major center for trade and communications. The culture of the country is an amalgam of Malay, Chinese and Indian. Its strategic position, at the juncture of the Indian and Pacific Ocean, makes it the gateway of Asia. Singapore tourism offers many an opportunity for all types of travelers. Check out more on shopping in Singapore. Get the lowdown on flights to Singapore and arm yourself with information on the weather in Singapore and what you must see. Singapore is well connected to almost all the major cities of the world. Its airport, the Changi Airport, has more than 60 flights connecting nearly 145 cities around the world. There are two ways to reach Singapore, the Pacific or the Atlantic route. British Airways, KLM, Swiss Air, Lufthansa, Singapore Airlines, Emirates, Air France and Cathay Pacific are some of the major airlines that take the Atlantic route. Japan Airlines, All Nippon Airlines, Korean Air, Malaysian Airlines, Northwest Airlines, Thai Airways, United Airlines are a few of the major ones that fly over the Pacific Ocean. The official languages of Singapore are Malay, English, Mandarin and Tamil, a reflection of its diverse population. The unit of currency is Singapore Dollar, S$. As Singapore is close to the equator, there are no major seasonal changes. The climate is warm and humid throughout the year with average temperatures ranging from 68 - 86 degree Fahrenheit. The main rainy season is from November through January while the dry months are May to July. Light, cotton clothing is best suited for your trip to Singapore and don't forget your sun block and hats. Singapore Standard Time is 13 hours ahead of Eastern Standard Time and 16 hours ahead of Pacific Standard Time. Singapore is famous for its MRT (Mass rapid Transport) system which connects every part of the city. Other than this, there is also a very good network of buses. But the most popular mode of transport is the taxi, easily available and affordable. Maxicab, a six seater, is another means of transport which connects the airport with almost all the hotels of the city. Singapore also happens to be one of the cleanest cities of the world with fines of nearly S$1000 imposed on persons found to be littering the city. The city of Singapore offers a wide range of accommodation to suit all tastes and budgets. Tourists have the option of staying in budget hotels, youth hostels, boutiques or luxury hotels. Visitors can choose to stay at any hotel in Orchard road, if shopping is their main agenda. Business visitors can choose a hotel in Raffles Place, the center of trade and commerce. For those who are interested in experiencing the ethnicity of the city, stay at any of the charming boutique hotels. And for those preferring quiet and solitude, hotels in Sentosa Island is a good option. You can never be far away from an eatery in Singapore. Western, Chinese, Malaysian, Arabic, Indian - all these and more are available. In fact, Singapore is called the Food Capital of Asia. Tourists can attend the Singapore Food Festival, held every year in July, which boasts of carnivals, workshops and joint food programs. The city is also famous for its hawker centers, which are extremely hygienic. Some of the must-try dishes include Bak Kut The, Char Kway Teow, Chilli Crab, Pepper Crab, Rojak, Roti Prata, Satay, Laksa, Curry Fish Head, Fried Carrot Cake and Hainanese Chicken Rice. The Jurong Bird Park is an open concept park and is home to over 8000 birds and also has the largest hornbill collection in the world. The tallest man made waterfall is another attraction. The birds are housed in aviaries that duplicate their natural environment. There are many bird shows featuring birds that sing, play, talk, swim and even draw! Night Safari is another major attraction which offers a rare glimpse into the nocturnal activity of various animals including leopards, tigers, hyenas, jackals and rhinoceros. There are three walking trails which allow visitors to observe the animals without disturbing them. A tram journey with live commentary is very popular with the tourists. Singapore Crocodilarium has over 1000 crocodiles and visitors can observe them in close proximity. The Underwater World at Sentosa Island offers a deep sea experience where you can see sharks, stingrays, eels etc in their natural environment. The Chinese and Japanese garden are also must see places with bridges, gateways, fountains and a Pagoda. Bukit Timah Nature Reserve is one of the two rainforests in the world within city limits and is home to a variety of bird and animal life. The Singapore Science Center is great for visitors traveling with kids as the center is one of the best in the world and houses nearly 850 interesting science exhibits. Singapore also has number of museums including Art museum, National Museum, History museum, Navy museum and Museum of Shangai Toys amongst others. Sentosa Island is another major tourist attraction which houses Fantasy Land, Volcano Land, The Merlion, Sentosa Orchid Gardens, Fort Siloso, Central Beach, Maritime Museum, Butterfly Park and Insect Kingdom Museum. For tourists to Singapore seeking adventure and nature, take a trek through Sungei Buluh Nature Park. Do not miss to wander through the mangrove forest of Pulau Ubin. Orchard Road is the main center for shopping in Singapore and houses some of the best boutiques, international department stores, specialty shops and bargain counters. Chinatown offers Chinese rosewood, Indonesian batik and Thai woodwork amongst other things. China Town has plenty of small shops selling Chinese bric-à-brac along side traditional Chinese medicine. Little India offers Indian items. When you are in China Town, don't miss the Buddha relic Tooth Temple which has Buddhist Mandala architectural style and is integrated with the art culture of Buddhism in the Tang dynasty. Sim Lim Square is a another place for electronic and IT products. Look for bargains at street markets. Pick up items from Chinese hand painted fans and wooden furniture to caneware and batik sarongs. The Great Singapore Sale is another initiative of Singapore tourism to lure shopping tourists from all over the world. Little India is famous for its exotic spices and silk centers. Arab Street and Holland Village offer places that sell art and antiques. You can also shop in one of the suburban malls which are located throughout Singapore. To sample the nightlife of Singapore, visit the Joo Chiat area in east Singapore. Great food, fabulous shopping, wonderful natural parks and throbbing night life - Singapore is blessed with this and plenty more, thus making it one of the top destinations to visit in Asia. First Published Date: Aug 13 2006 Last modified Date: April 25 2019 This page may have been updated recently as new information is available or the content may have been edited for better readability.